Just what Batman needed: more technology! 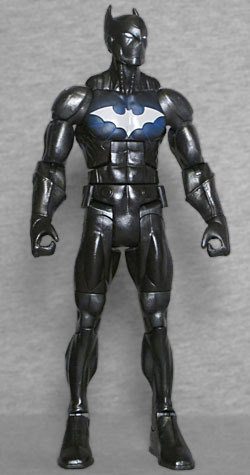 Masked vigilante who uses technology and weaponry in the name of justice; later becomes a member of Batman Incorporated. The original Batwing was David Zavimbi, a Congolese policeman who became "the Batman of Africa." 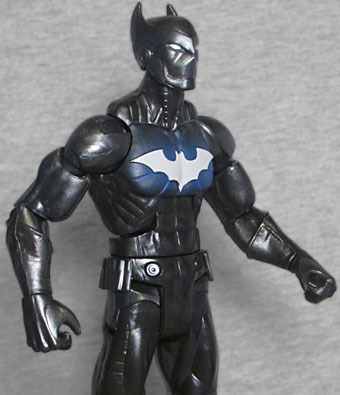 Bruce Wayne gifted him with a suit of powered armor so he could be a member of the international Batman Incoporated initiative. After a particularly rough patch where the girl he loved betrayed him, corrupt police officers tried to kill him, and Matu Ba (his version of Alfred) died, David gave up the identity to find his own way in life. So the second Batwing is Luke Fox, son of Lucius Fox; he's no longer the Batman of Africa, and is more the Batman of "wherever the heck Bruce Wayne decides to send him." Zavimbi's costume (inspired by a story in 1973's Batman #250) left the wearer's face exposed, which honestly seemed like an oversight: brother was a member of the police force, isn't there a chance his coworkers will recognize him? Luke's costume, by contrast, features a full-head helmet with no features other than white eyes and pointy bat-ears. All of this costume, including the helmet, has a lot of mechanical details to make it look like armor and not just spandex, which means there's an alarming amount of new sculpts for a Mattel toy! Honestly, the only things that might be reused are the biceps, the hips, and everything from the thich joints down. he has gloves with raised edges and prominent knuckles, there are thin lins on the chest and control cables on the throat, lines on the thighs, and rather than wearing a belt, he has two little ports and a few thin canisters at his waist. Look at you, Mattel, doing better than we'd expect from you! But not when it comes to articulation - that's the same as ever. In fact, this figure has something we haven't gotten on a DC figure in quite some time: a joint that completely shattered when I tried to move it. Oh, yay. Remember when that used to be an almost everyday occurrence? Well, this time he left ankle snapped under minimal pressure, so now my Batwing's foot is glued on - I got this at Toys Я Us, so it's not like I could take it back for a replacement, even if the figure was plentiful. On the plus side, the head balljoint is a little loose, but that just means the figure can look up and down a little, rather than being limited to side-to-side motion. That's particularly good, since Batwing lives up to his name by wearing a winged jetpack. That's a separate piece included as an accessory, and it plugs into the figure's back. 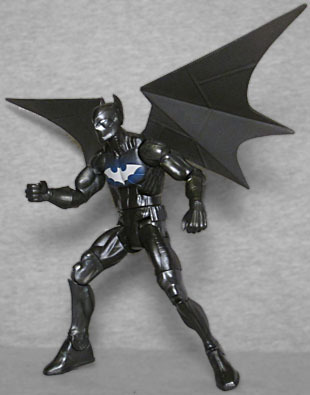 Actually, between those wings and the dark, technological suit, Batwing really looks a lot like a proto-"Batman Beyond," though if that were the case you'd expect his accent color to be red, not blue - the symbol on his chest is painted white, but it's got a blue airbrushing around it to make it clear that it's something bright and glowing, not just white paint on the character's armor. The only accessory the figure gets is the wing pack, but he does have some pieces of this series' Batbot Build-A-Figure: both arms, and the robot's gun. Not bad! I was on the fence about Batwing: I wasn't as sold on him as I was Duke Thomas, but neither was I as fully disinterested as I was about Rebirth Batman. Finding him in person tipped me over the edge, and if it weren't for the broken joint, I'd be completely satisfied with the purchase.